The past weekend we took a 2 hour drive up to the Collegats-area north of Lleida. It might not come as a big surprise to you who follow Climb in Spain that this is yet another post about a conglomerate area. For me personally I find the climbing offered by conglomerate simply the most interesting sport climbing there is (with the added bonus that it doesn’t get as polished as limestone). All my favourite areas are conglomerate – Montserrat, Margalef, Montsant, Malpas de Trevil, Riglos… So when I talked to Pete O’Donovan and he mentioned sector Cine I of course started planning a visit. Even after 2½ years climbing in Catalunya I hadn’t even heard about the area, which says something about the abundance of climbing that can be found here. But thanks to the new guidebook from Pete and Dani we now had a topo. The idea was to climb one day at Sector Cine and one day at one of the limestone areas just a kilometre away. So to the climbing. It is steep, way steeper than normal for the easier climbs. There is a 6a+ where you end up about 4 meters out from the wall when lowering off the anchor. The holds are normally between big and huge and the moves are powerful. There is a 6a+ and a 6b in this sector that I would rank as some of the best in that grade span I’ve done anywhere, incredibly fun climbing! The grading varies but we agreed that it is on the stiff side on many routes, especially if you’re not used to climbing steep. The most interesting routes are between 6a and 7a, above that the climbing becomes more like in Montserrat or Montsant with more pockets. These walls are not covered by the Lleida Guidebook so if you find yourself liking the climbing it might be worth picking up the new Collegats guidebook. The sector is definitely a winter sector. With sub zero temperatures at night I would say we had well above 25 C on the wall during the day. Luckily we had brought shorts and could enjoy the first really warm days of the year. At the end we ended up climbing two days in the sector since the limestone areas where too cold. We didn’t regret it one second. So if you find yourself in the Lleida area and want to try something different, don’t hesitate to head up to Collegats and Sector Cine! 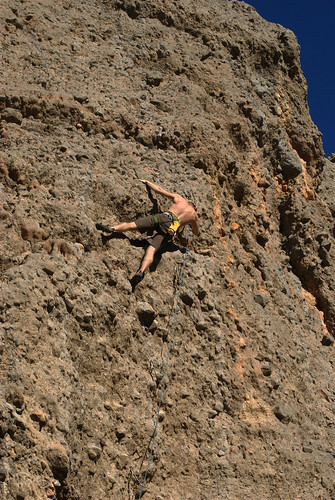 Tagged with conglomerate, Crags, lleida, sport climbing.